A pilot was injured when his microlight aircraft crashed at an airfield in Berkshire. The plane came down at Brimpton Airfield, Wasing Lane, Aldermaston, on Saturday afternoon. The pilot was trapped for more than an hour while emergency crews from Berkshire and Hampshire worked to cut him free from the wreckage. He was airlifted to the John Radcliffe Hospital in Oxford where he is said to be in a stable condition. 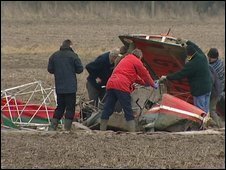 A Brimpton Airfield spokesman said the microlight was carrying out "routine flying procedures within the recognised circuit of the airfield" before the crash. "During one of these procedures, when the aircraft was climbing away from the airfield, the aircraft appeared to lose height and banked to the left," he said. "At this point, the aircraft continued to lose height and crashed. "The pilot was treated by airfield members until the arrival of emergency services."